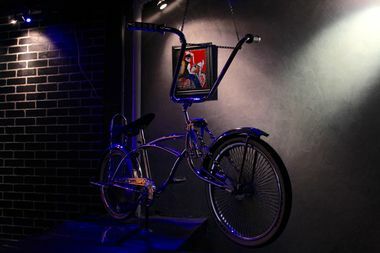 A low rider bike is part of the decor at Cholo Noir, a Chicano eatery slated to open in the East Village. EAST VILLAGE — A Chicano-inspired eatery that was twice shot down by a local community board in its quest to secure a liquor license is moving ahead with plans to open at 503 E. Sixth St. in March. Proprietors of Cholo Noir, a forthcoming West Coast-style Mexican restaurant and art gallery, are still waiting for the State Liquor Authority’s decision on their application to serve booze. But regardless of the authority’s ruling, the space is still gearing up to serve food in about a month, said one of the owners. Community Board 3's State Liquor Authority Subcommittee twice voted to recommend the SLA deny the application, arguing the concept did not present enough community benefits to warrant allowing more liquor on a largely residential block in a neighborhood already steeped in nightlife. But owners remain positive the eatery will be a good presence in the neighborhood, claiming Cholo Noir will centered around the food, with cocktails to complement the menu. “Most people don’t go into a Mexican restaurant and say, ‘Let’s go get wasted,’ but people do go for good Mexican food and they like to have something to complement it,” said Paul Le Mos, who plans to run the restaurant alongside Lennard Camarillo, former operator of West Village eatery Florencia 13. The proprietors don't want to bring another noisy bar to the neighborhood, he said, but want to serve the community with great food and culture. Le Mos says the establishment could help enliven the East Village the way he says One Worldwide Plaza enlivened his own neighborhood of Hell’s Kitchen. That area was crime-ridden when he moved in decades ago, he says, but the extra influx of restaurants and accompanying crowds has made it safer and more pleasant. "It's crowded and there's a lot of people, but it's behaved, it's not out of control," said Le Mos of his neighborhood. Camarillo has pitched Cholo Noir as a restaurant as well as an art gallery that will showcase the work of local Latino artists. The restaurant space is currently decked out with art primarily from Latin artists — mostly Mexican, but Camarillo said he also plans to bring in Puerto Rican artists from the East Village — as well as a low-rider bike Le Mos said is an homage to the Chicano culture celebrated by the venture. The venture's application to serve liquor was first shot down by the community board subcommittee in June. It was denied again upon returning in August with more signatures from community members supporting the operation. The owners also boasted a first-place grant from the New York Public Library’s New York StartUP! Business Plan Competition. At the time of the most recent denial, Camarillo told DNAinfo New York he wasn’t sure if he could move ahead with the opening without the revenue from liquor sales. He did not immediately return a request for comment on whether he now believes the business could stay afloat without the extra revenue. The business applied for the license on Feb. 6, SLA records show. The owners have two upcoming meetings with the State Liquor Authority in the coming weeks to discuss their application, said Le Mos. If the authority denies their request for a full liquor license, they plan to return with an application to serve only beer and wine, he said. But while Camarillo plans to move ahead with the opening regardless of the SLA’s ruling, Le Mos said he will likely drop out if the restaurant is denied booze across the board. “I know Lennard would move forward, but I don’t see why I would be involved,” said Le Mos. “I eat out every night of the week. If I go to Mexican food, I order a margarita or have a cold beer. That’s what I like, and I want this place to be a reflection of me."